From day one, it has been our objective at INSXCloud to provide brokers with the tools they need to increase efficiency and help them grow their business. IHC is the perfect partner for us to further our mission. 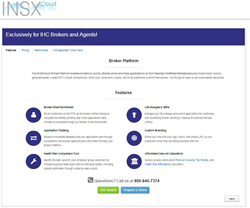 The IHC Group (IHC) today announced a strategic distribution alliance with INSXCloud, making IHC’s ancillary products available on the INSXCloud Broker Platform, a Web Based Entity (WBE) enrollment site. WBEs are certified by Centers for Medicare and Medicaid Services and play a crucial role in connecting consumers to the federally facilitated marketplace. Based in Akron, Ohio, INSXCloud allows insurance producers and brokers to easily quote, and enroll clients directly onto healthcare.gov and track their applications. The platform also enables client management when there is a qualifying event resulting in a special enrollment period. Additionally, INSXCloud provides health insurance comparison tools to identify the best value for the enrollee, as well as Affordable Care Act calculators to help estimate premium subsidy, tax penalty and health plan affordability. IHC will offer INSXCloud access to producers working with its subsidiary, IHC Specialty Benefits. IHC’s ancillary products that will be available through INSXCloud include individual dental, gap, telemedicine and association plans. For more information on INSXCloud for The IHC Group, please call 952-746-6610. You can also visit https://ihc.insxcloud.com for additional information. About IHC Specialty Benefits, Inc.
IHC Specialty Benefits d/b/a Health eDeals Insurance Solutions is a full-service marketing and distribution company that focuses on small employer, individual and consumer products. Products are marketed through general agents online, telebrokerage, advisor centers, private label and directly to consumers. Headquartered in Akron, Ohio and designed by a broker with over 20 years in the industry, My1HR, Inc. provides cutting edge software solutions and professional services to health insurance issuers and brokers. Today, thousands of insurance brokers use My1HR technology to quickly and accurately quote and directly enroll their customers through one of our INSXCloud Issuer Platforms or the INSXCloud Broker Direct Enrollment Platform.